The “Joey Hand home race at Laguna Seca” story is an annual part of the IMSA WeatherTech SportsCar Championship calendar (last year’s piece here). There’s a reason for that. Hand’s yearly trip to WeatherTech Raceway Laguna Seca is always a highlight of his year. Monterey serves as the closest race to home for the Sacramento native. It’s also the second California race of the year. Somewhat surprisingly he hasn’t won at the track, and his longtime co-driver Dirk Mueller has only one win there in 2008. Nonetheless, this is always a big weekend for the American in the No. 66 Ford GT for Ford Chip Ganassi Racing. Hand’s wife Natalie, son, daughter and friends will attend the race. Hand and Mueller enter the weekend nine points behind GT Le Mans class championship leaders Jan Magnussen and Antonio Garcia of Corvette Racing. They’ve won twice this year, at the Sahlen’s Six Hours of the Glen and at Lime Rock Park. Hand scored the first of Ford’s four poles this year on the streets of Long Beach back in April. Teammates Ryan Briscoe and Richard Westbrook have three wins, and sit second points only four back of Magnussen and Garcia. 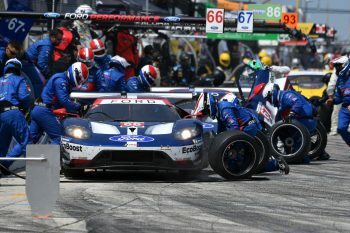 Briscoe and Westbrook delivered the Ford GT its first worldwide victory at Monterey in 2016. A fuel mileage gamble paid dividends and revealed the economic excellence of the twin-turbo V6 Roush Yates EcoBoost engine. That set the stage for Ford’s run of three wins in a row that year. Hand and Mueller will look to match their teammates on three wins this year. 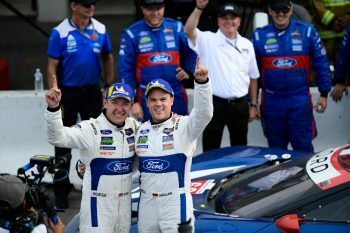 If they do, or if Briscoe and Westbrook win their fourth win of the year, Ford will have a 60 percent strike rate this year of six wins from 10 starts, and close on securing the manufacturer’s championship.